Every Christian has a story of redemption to tell. 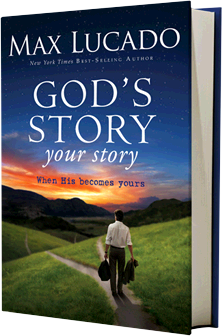 One would be hard-pressed to find a better story-teller than author Max Lucado. 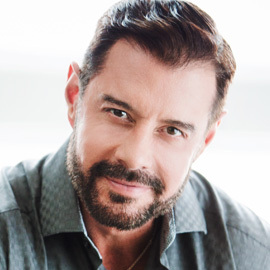 Max has been a best-selling author for over two and a half decades. I remember reading my first Lucado book during my graduate school days. Chances are that if you’re a Christian, you have read some of Max’s books. I was thrilled as my company, The A Group, was chosen by Zondervan Publishers to lead in the efforts of getting Max’s latest release to the public. Our team under the leadership of Tami Heim, created a comprehensive marketing campaign that includes cover design, art direction, all traditional media, PR, social media and even a media-rich website with its own mobile app option for iPhone. Our intent is not only to market a great book, but to allow its important message to live beyond the written pages and to reach people wherever they are in a way to makes sense for them. In God’s Story, Your Story, Max’s inspires us to see how our own day-to-day story intersects with God’s grand, overarching epic of everlasting redemption. This book is all about our faith stories and how they fit in God’s own timeline. The idea of a website where people could share their story of faith, or testimony, came early on and grew legs. 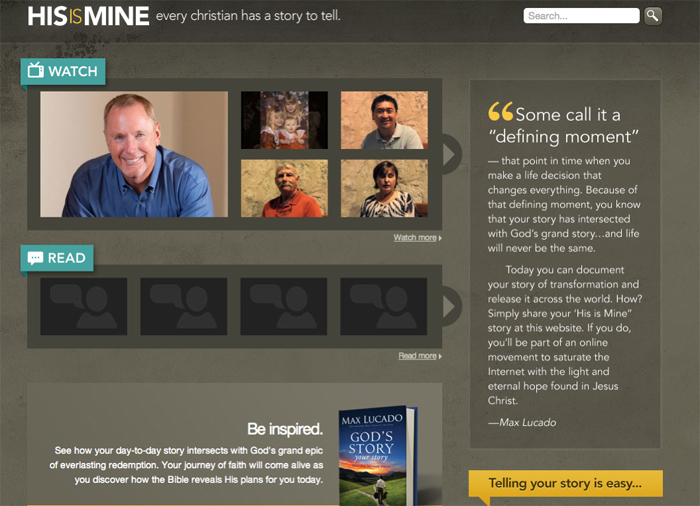 HisIsMine.com is place where you can write, upload audio or video of your own story of faith. To make the site more accessible, we created a mobile app for the iPhone. The book officially releases next week, but you can buy it on Amazon today. You can share your own story right now by clicking here. In the next few days, you’ll be able to download the mobile app to make that experience even more convenient. While there are some foundations of marketing a book, there are no cookie cutter marketing strategies. Let me rephrase that: there should not be cookie cutter marketing strategies. Each plan our team creates is different. If you start with “how can we get this message to those who need it the most?” be prepared to break the mold and come up with new ways to engage your audience. Do you read most paper or ebooks? Even though my current reading shelf has about 8 “hard copy” books on it, I’m trending toward reading e-books. I have an iPad2, and I find myself going more that route. On that note, the Kindle app is slowly becoming my ebook reader of choice, but I tend to use the iBook app for reading any pdf files. Though, DRamsey’s new book had video options on the iBook version, which Kindle didn’t have. The funny thing is that my wife is a public Librarian, so every now and then she brings home a hard copy (scifi and fantasy my childhood favorites) for me to read, give my opinion on, so that she can relate it to her boss. I’m 90% digital right now. I like the Kindle app as well. Thank you for stopping by, Lance. You never know when our paths might cross . Sounds like an exciting project for you guys! And I agree – there is no one marketing strategy that works for everything. Each product, each audience is different, and the marketing strategy should be as well. As far as my reading preference – I enjoy paper books the most. There is just something about having a real book in my hands, turning the pages, making notes and underlining sentences that I enjoy. That being said, there are some books I read on my Kindle. While I have a love for paper, I have no tolerance for heavy bulky bags for books. I wouldn’t read as much if I had to hall books around with me. Oh I agree. Whenever I travel, I buy the ebook version. I want my carry-on as light as possible. Plus I use the eversion whenever it’s offered drastically cheaper or free. But there are just some books I have to own the paper version. Congrats and the site is lovely! You guys always do stellar work. I’m still a paper book guy. Just like holding it, underlining in it, immersing myself in it (away from anything else digital)… but I’m sure in time I will transition more to electronic. Thank you Daniel for the kind words. I love the paper books but since I travel so much, digital is the only way to go. Beautiful website and great campaign. The touch of genius and the hand of God is obvious in every aspect. Congratulations! Thank you Audrey. It’s always fulfilling working with a message we believe in that can impact so many people. That is awesome! Congrats on landing Max Lucado’s newest book. Love the concept. Lately I tend to read more ebooks, but I still like a hardback once in awhile.